Woke up this morning, I was wondering whether I should be making my morning hike as there were some thunder storms during the night. The treks will be soggy and maybe even slippery. We have the wettest April in 60 years and I have not been able to hike for worrying that the paths are too slippery. The sun has come out and I decided to take a chance. Half an hour into the walk, I noticed these white flowers fallen on the trek; they are still fresh and not trampled over. They look like a painting. Continuing on, I was somewhat surprised by what I saw. A little red crab was blocking my way. I was quite puzzled as I have never seen them before at this hillside location. OK, the crab maybe 20 meters away from a mountain stream. I gather these crabs are amphibious. He was looking quite angry at me with his little bright eyes. Then continuing on, deeper into the forest was this tree which still has some red maple leaves at this time of the year. All I had was a smartphone. The tree is a bit out of focus, but never mind, I know my readers will forgive me with the somewhat blur picture. Then I stumbled on some fungi or mushrooms on a tree stump. I know some of them are poisonous. Towards the end of my hike, I found another tree stump. It looks rather abstract, with some fungi attaching to it. I was thinking of the theme for this week’s Photo Challenge – Abstract – does it look abstract. I wish I had taken a proper camera with me. Anyway, please enjoy the pictures – as much as I have enjoyed my early morning walk. The picture was taken three years ago when we re-visited Beijing. As different from our past visits to Beijing, the trip focused on natural rather then historical aspects of Beijing and its suburbs. 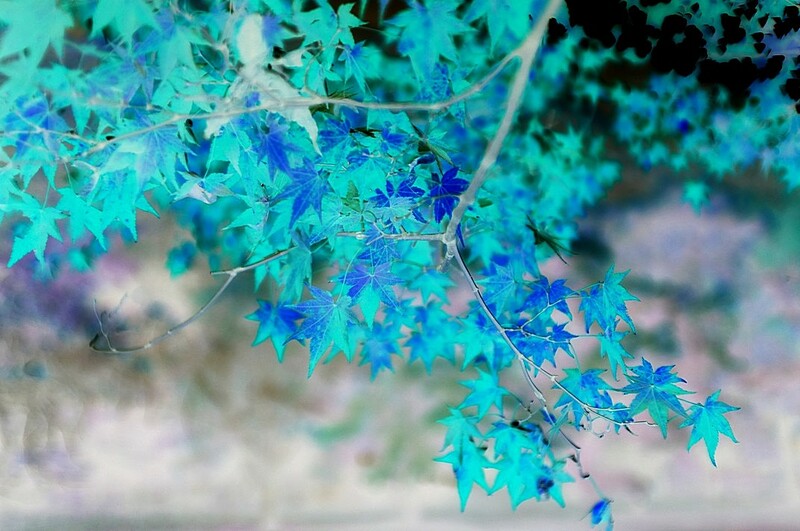 These leaves taken against a red wall in HongLuo Temple is one of my favorite photo in that trip. This happy place can be any where in the world. This is just a small corner of the overall picture I saw. There are many red maple leaves which are smaller in size than the leaves we used to see. They were mixed happily with other colors. Together, they form a happy picture. Picture taken in South Korea in the fall. 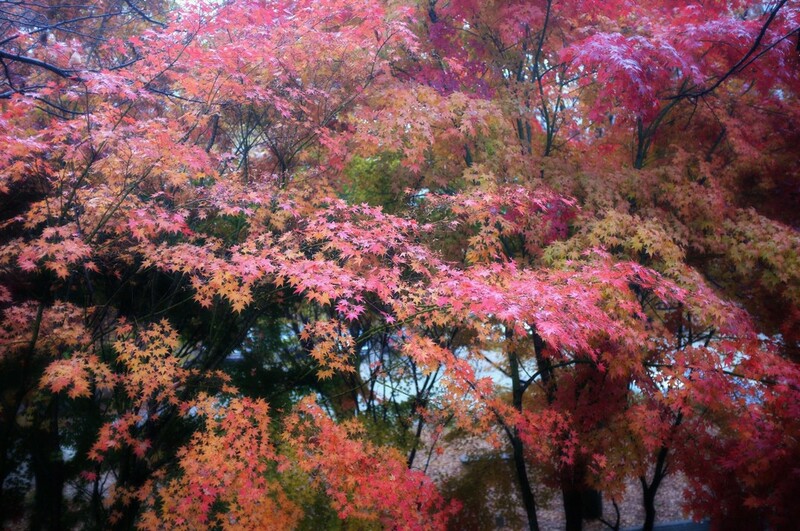 Here is a photo of the maple leaves taken a couple of years ago in South Korea. I focused only on the leaves, leaving the background blur.